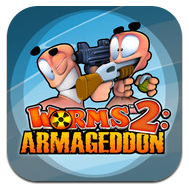 Worms 2: Armageddon (v1.12) — Mobers.ORG — Your Daily Source For Mobile FUN! Body Count Mode: The player takes on endless waves of increasingly tough enemies across 5 different themes or a random landscape.Practice Mode: A mode where the player can practice with every weapon against A.I. dummy worms. Plus+ integration provides in-game Awards, Friends list, Leader-boards. Post your high scores and achievements to Twitter and Facebook. Unlock up to 30 in-game awards.